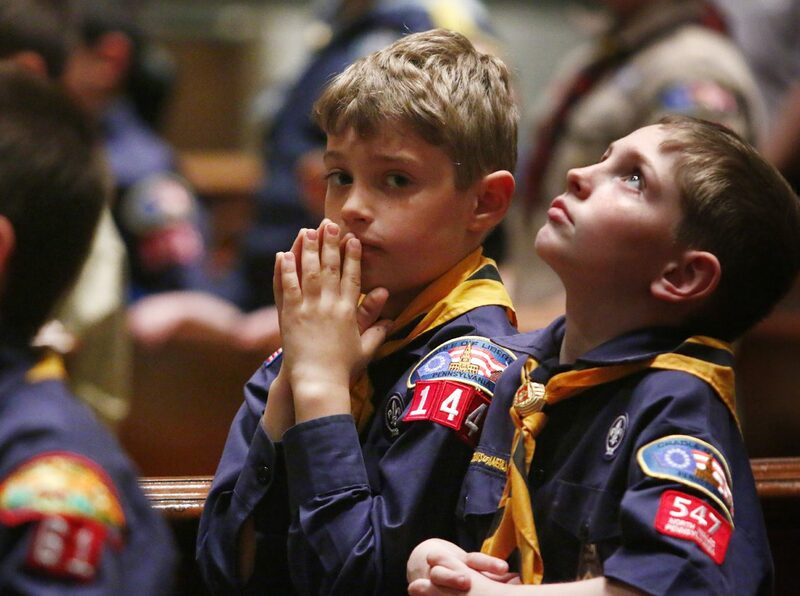 Two Cub Scouts get what may be their first look at the Cathedral Basilica of SS. Peter and Paul during the annual Mass for about 200 Catholic Scouts and their leaders April 22. Catholic scouting troops across the Archdiocese of Philadelphia gathered for prayer on Saturday, April 22 for the 2017 Scout Mass celebrated by Archbishop Charles Chaput at the Cathedral Basilica of SS. Peter and Paul. Recognition and awards for the members and leaders of mostly Boy Scout troops and Cub Scout dens were presented at the Mass. The homily at a Mass is traditionally built around the readings, which can be tricky for a special Mass for a group that had no counterpart in biblical times. The particular readings during the Easter Season focus on the Risen Christ in the Gospels and the doings of his followers through the Acts of the Apostles. In his homily, Archbishop Chaput focused on the first reading and mission of the scouts as it applies to this generation. He spoke of the courage of the apostles who performed miracles and boldly preached the word of Jesus, in spite of admonitions from the Jewish leadership. “We learn the early disciples were bold and courageous and even after the world around them didn’t want them to speak about Jesus, they felt obliged to do so,” the archbishop said. He urged the young scouts to follow that example, to grow up to be responsible men; responsible for themselves and for others. Scouting, he said, would help them to become leaders, not just leaders of government and family but leaders in the body of the church. “You receive these gifts from God, it is important that you use them,” he said. During his homily, the archbishop used the artifice of questions to a volunteer scout, and Cody Kulik of Troop 34 at St. Jude Parish, Chalfont, filled the task admirably. In answer to a question as to how God is important to him, Cody answered, “God is all around me and is a major part of my life.” He agreed he will be a better man because of Scouting and would urge other boys to join. A Boy Scout for eight years, Cody received the Ad Altare Dei Award at Saturday’s ceremony. He has in past years received the Light of Christ Emblem and the Pope Pius XII Emblem, and soon expects to attain Eagle Scout, the highest ranking in Boys Scouts. While almost all of the recipients were Boys Scouts, there were also a small number of Sea Scouts, which is composed of boys and girls, and Adventure Scouts, a teen group which is part of the Boy Scouts of America but can either be all boys, co-ed or all girls. Emma Bromley and Clayton Bromley, who are brother and sister, are both members of Crew 1729 in Adventure Scouts. Their Crew title was chosen because their sponsoring parish, St. Thomas the Apostle, Glen Mills, was founded in 1729 and is the oldest parish in the Philadelphia Archdiocese. Adventure Scouts have a special focus on the outdoors with hiking, rock climbing, scuba diving and other such activities. Clayton has been in Scouts for eight years, and has received all four of the Catholic emblems: Light of Christ, Parvuli Dei, Ad Altare Dei and Pope Pius XII. He was recognized at the ceremony for this achievement as one of two scouts to receive the Archdiocese of Philadelphia Catholic Scouting Award. Emma, on the other hand, has only received the Pope Pius XII Award, for the simple reason that all other branches of the BSA are boys only. But she is the president of Crew 1729, so she is catching up. In all there were more than 200 scouts on hand to receive their awards at the Mass. Although these were Catholic awards, in a nice ecumenical touch, a number of the recipients were Catholic kids belonging to troops or packs sponsored by other local Christian churches, according to Stephen Dominski, who is chair of the Delaware County Catholic Committee on Scouting. “The Scouts are doing well, and it is important to recognize the good woks of our kids,” he said.